Jamaica Stock Exchange Limited (JSE) has advised that a connected party purchased 2,000 JSE units on July 25, 2018. The Jamaica Stock Exchange Limited (JSE) has advised that the meeting of their Board of Directors to consider an interim dividend payment will be held on July 19, 2018, and not on July 18, 2018, as previously stated. The Jamaica Stock Exchange Limited (JSE) has advised that at a meeting of their Board of Directors to be held on July 18, 2018, the directors will consider an interim dividend payment recommendation. 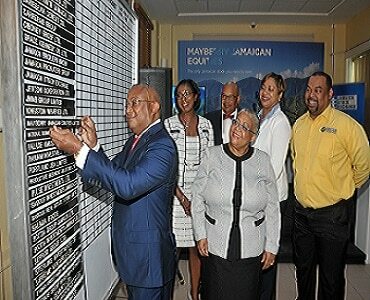 Jamaica Stock Exchange (JSE) has advised that a connected party purchased 200,000 JSE shares on June 20, 2018. Jamaica Stock Exchange (JSE) has advised that Mr. Ian McNaughton and Mr. Gary Peart have been re-elected Chairman and Deputy Chairman, respectively, of the Board of the Jamaica Stock Exchange, at a meeting of the Board of Directors of the Company held on June 21, 2018. Have you downloaded your Mobile App? The Jamaica Stock Exchange (JSE) continues to keep a pace with the demand of easy access of market information with the company’s Mobile App. Available in the Google Play Store for FREE.